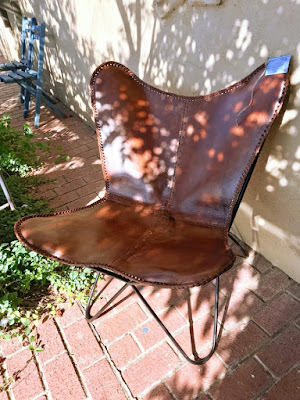 I would love to sit in one of these aged leather butterfly chairs today and talk to Robert Redford about his new upcoming movie with Sissy Spacek wouldn’t you?? They are comfy, stitched with beautiful leather, and would be neat just about anywhere! We have a pair of these chairs looking for that perfect home! Where would you place this neat chair in your home?